While I would love to share stories and images from many of my makeup jobs, client confidentiality is an important part of being a professional. 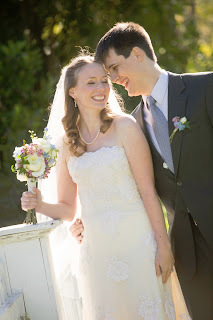 However, when my sister got engaged, I hoped that I would get to do her makeup on her wedding day. She kindly obliged, and she also generously let me share the details with you. 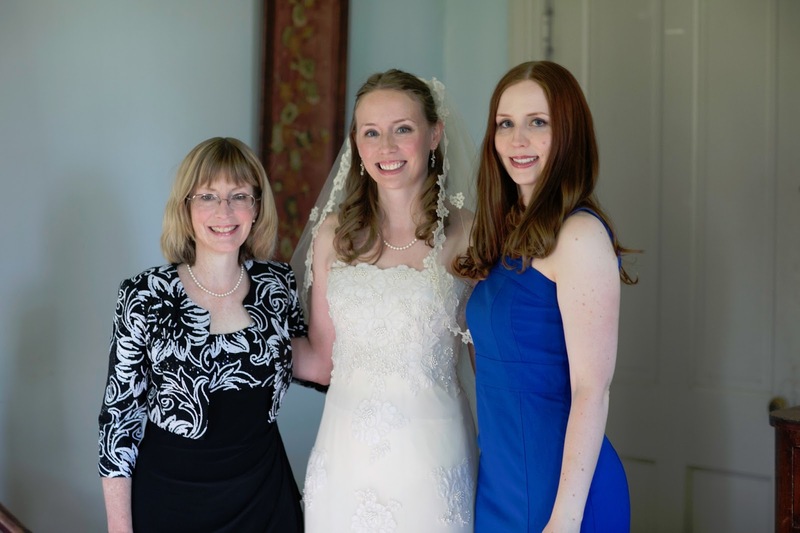 So just what it is like to do a bride's makeup? Read on and find out. Discuss the bridal look with the client via phone or email. For example, my sister sent me some images of Kristen Bell and Emma Stone with red carpet makeup, which gave me an idea of the look she wanted. Choosing a celebrity with similar coloring can help a great deal in making a selection for a wedding day look. Run through the entire look with the client. Review images with client again (I recommend having printouts handy). Choose a "target look" (ours was this image) and do your best re-creation the client's face. Look for any large differences between the celebrity and be sure to bring up anything that may turn out differently than your client expects before applying makeup. For example, if a client only gives you images of a warm-toned celebrity and they have a cool skin tone, let them know you will choose similar but different shades to better suit their complexion. Also, mention if you think false lashes are being used and see if this is something your client is interested in doing. Be prepared to re-do the look. I usually re-do the look with most of my bridal clients, especially around the eyes. Most brides actually want something very similar, but the trial run is the time to indulge your client if they really want to try that "peacock" look or retro style before the wedding. Take notes and photos. Once you have settled on a look, take reference images (including one each with eyes open and eyes closed). Also, take notes regarding which products you used. I use Alcone's face charts. Set aside the bride's makeup, using your notes for reference. This ensures that you will at least have all her makeup ready ahead of time, and won't have to dig through your kit to find any missing item. Leave for bridal venue. 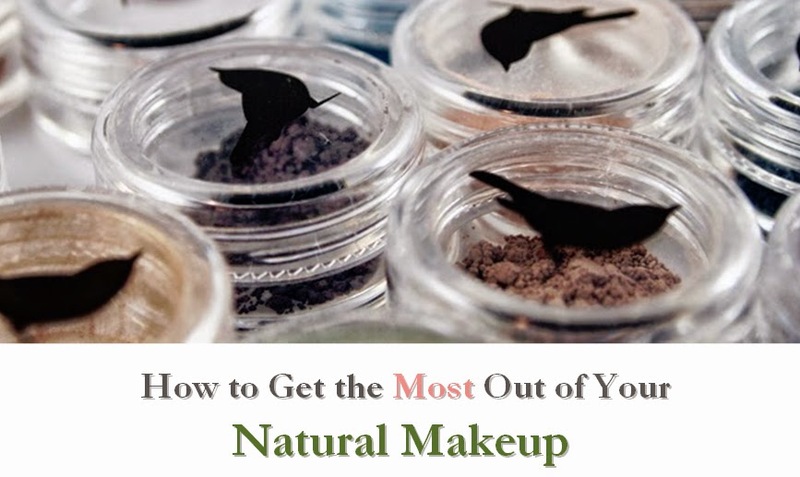 Load up makeup kit and head to the venue (or, in some cases, a hotel or residence). Some wedding venues can be quite far from the city, so plan accordingly and aim to arrive early. As the artist, you want to make sure you are either wearing no makeup or have makeup perfectly applied. Arrive at the venue and set up. Create a space to apply your makeup. Ideally, this should be somewhere peaceful where the bride and other members of the bridal party can relax. Natural light is important as well. Apply the bride's makeup. This should be done before anyone else in the bridal party. 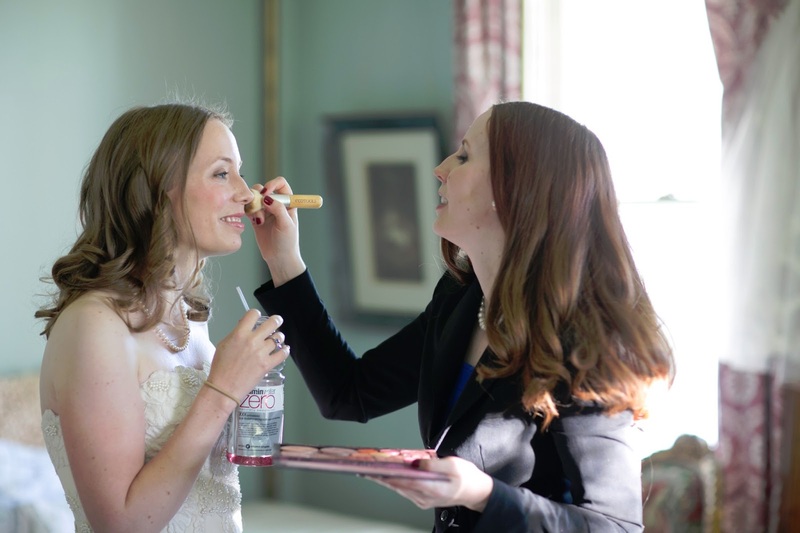 Although her makeup should already be ready to go, be sure to pay the most attention to the bride. You may also need to do apply makeup simultaneously with her hair stylist, if applicable. Apply makeup for other members of the bridal party. This includes the mother of the bride, bridesmaid(s), etc. I only had the mother of the bride left, but it usually takes about 20-30 minutes per person unless you are taking shortcuts (only doing eyes, for example) or are doing something very complicated. I try to never book more than two hours of time on my own; if you need longer than this, you should really be working with a partner. At this point, you want the bride is free to dress, get her hair styled, or just relax. Final bride touch-ups. Do one last check, especially for powder and lip gloss. Make sure she has everything she needs. Clean up and get out of the way. You want to be completely finished well before the bride even thinks about walking down the aisle. Don't be the person holding up the wedding. Aim to finish 15 minutes before you think you want to be ready, in case the clients are running behind or there are other unforeseen circumstances. After finishing at one wedding, some artists even schedule a second wedding in the same day. If you do, consider working with a partner and having a second set of brushes. Cleaning brushes between clients can take some time, and you'll need to be careful that you don't wet down a brush that you'll need dry later. It's a fun business, but be sure to plan ahead to keep the bride feeling calm and pampered like a princess on her special day. Thinking about going pro? 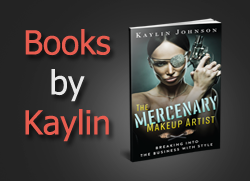 Check out my book, The Mercenary Makeup Artist: Breaking into the Business with Style.